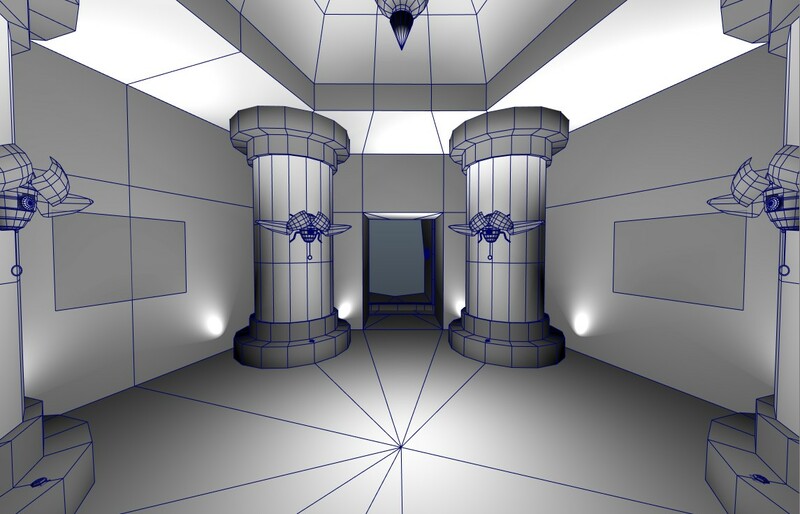 It’s no secret that here at the Starry Expanse Project we’re sticklers for accuracy in our reproduction of Riven, and at the center of this endeavor is camera-matching, the placement of cameras in a scene that represent individual shots from the original game. This process isn’t exactly complicated, but it can be finicky and requires a lot of patience to get the best results. There is a lot of animation in Riven. Putting aside the live-action character performances, there are buttons, levers, bridges, elevators and more. We use the same principles to reproduce these moving parts. 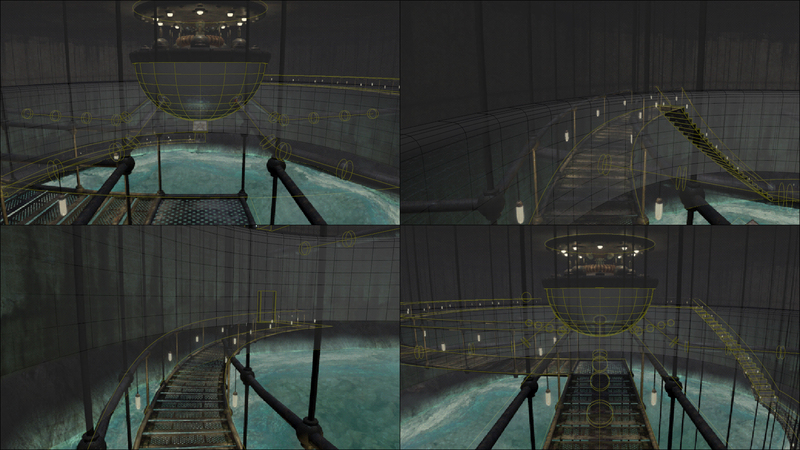 Camera-matching animation is relatively straightforward, as we use the viewpoint cameras we have already set up. Most animation files in Riven encompass a small section of a shot, so we have to carefully position them to make sure everything lines up. 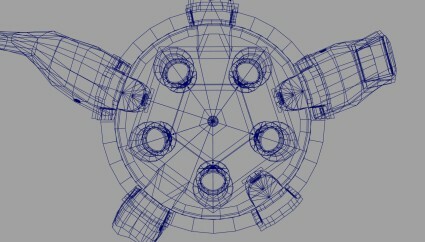 Once it’s set up, we can watch the animation in our 3D viewport and animate accordingly. 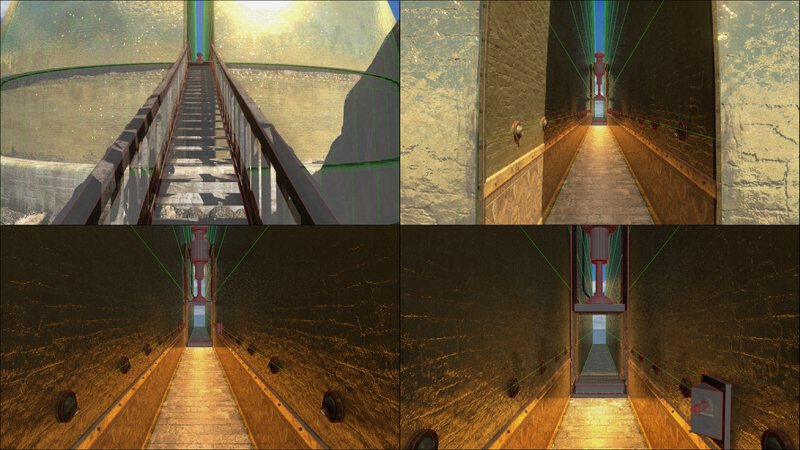 The fact that the original Riven was created in a 3D software package is incredibly helpful to our animators. 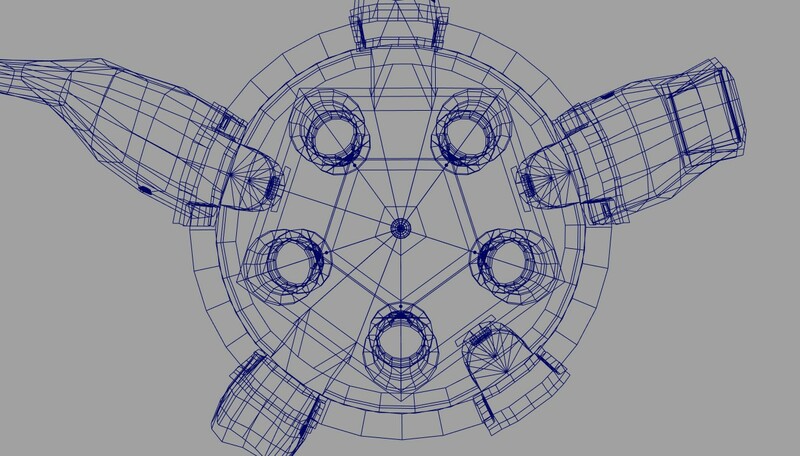 These programs allow artists to move objects in one axis, or rotate them precisely to a fraction of a degree. 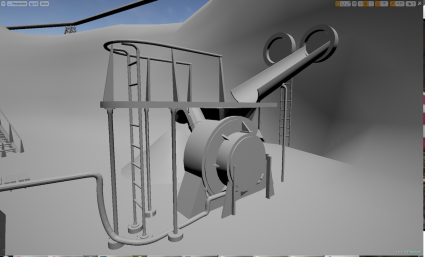 The original Riven team used these tools as well, which means we usually can take for granted that if an elevator is moving vertically, it will be moving perfectly in one axis only. Likewise, if an object is rotating 180 degrees, it’s very likely to be moving an exact 180 degrees. One interesting challenge that we face is to find a way to capture the feel of the Riven animations with a variable frame rate. All of Riven’s animations play at 15 frames per second, which is half of the 30 fps standard for games animation, and much smaller than the 60+ fps that we expect modern games to achieve. The difference in the feel of the animation is definitely noticeable. We hope this delve into our animation pipeline has been enlightening, and if you have any questions please leave a comment . There are still many challenges for our animation team to overcome (character performances in particular), and this will be the subject of another post in the near future. 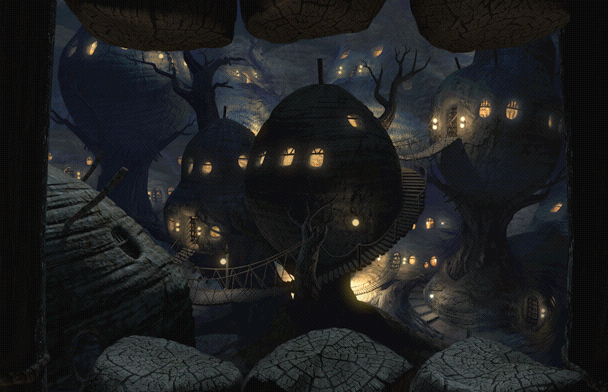 There are several areas in Riven that give players a look behind the curtain, allowing them a fuller glimpse into antagonist Gehn’s personal goals and motivations. One of these is his lab on Boiler Island. Its tables and shelves are full of objects that, if examined closely, will provide answers to many of the player’s questions. Over the last few weeks, our artists Francois Hurtubise and Nathaniel Grove have been hard at work bringing this area to life. 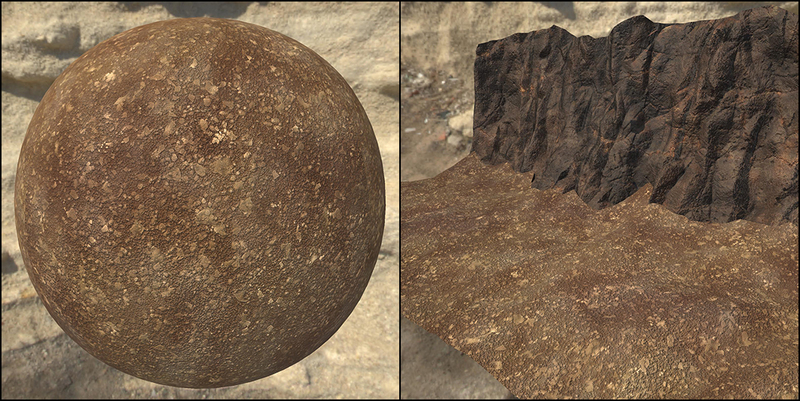 Here are some examples of work currently in progress. We’d also like to extend a big thank you to all those who contributed to the discussion last month! We were overwhelmed by the response, and enjoyed reading through your suggestions. The passion and attention to detail our fans bring to this project continues to motivate us to do our best possible work. We’re looking forward to discussing other important topics with you all soon. As such, we have a large collection of your suggestions. 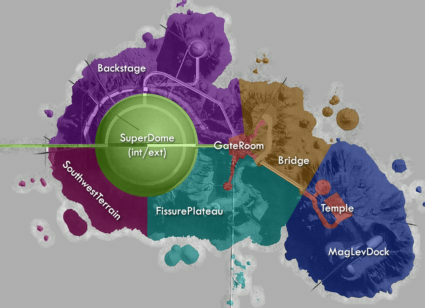 Candidates range from minimal impact additions like easter eggs (similar to those which already exist), significant alterations like weather variation, to whole new areas like Gehn’s 234th age (an area referenced but never actually seen). The ability to explore the Moiety village on Tay is one of the most popular recommendations. The number of these requests that we receive is not surprising, as the Myst series has set a precedent for bonus content. 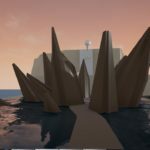 When realMyst was released, fans were surprised to discover Rime, a whole new age to explore which expanded the story and helped it dovetail into the sequel. The book press, an object that was removed at the last minute due to playtesting issues, and a hidden corridor to nowhere that seems to have been cut late in development. These things are not in the original game, but were clearly intended to be at one stage. 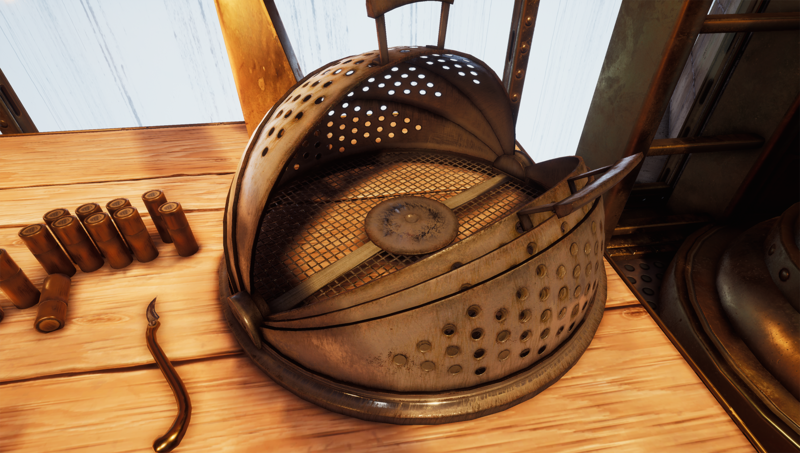 Could these objects be reworked back into the game? Perhaps they could! We are interested to hear what you think. Would you add these objects into realRiven, and if so – why or why not? Are there better examples of content that could be added first? Add your thoughts in the comments — we do take your opinions seriously. Our artists have been hard at work adding to the material library, our collection of commonly used surfaces that can be used in combination to recreate the detailed environments of Riven. Here are some recent examples, all created by texture artist Jacek Kalinowski! 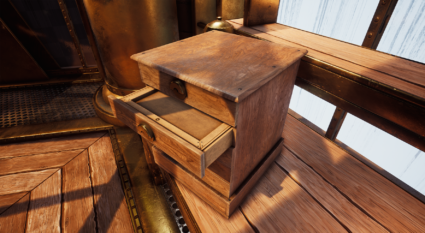 Our material system allows us to blend these surfaces together based on a texture mask, which gives our artists a lot of control over the fine details of each asset. Riven is a world of stark natural beauty contrasted against intricate machinery, and our material system allows us to reproduce it in the highest possible detail. 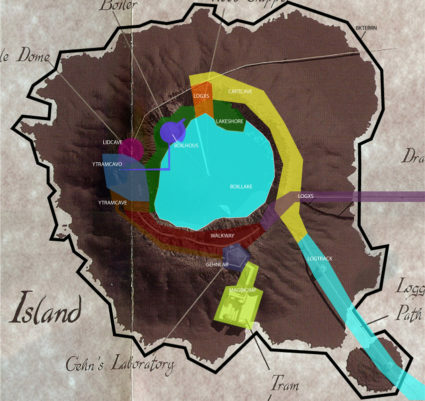 From the fine sand on the shore of Boiler Island’s volcanic lake, to the wear and tear on the Fire Marble Dome. Last month we shared some of our recent camera-matching work on Temple Island, and we noticed that there was some great discussion regarding the coloured region map we used to place the SuperDome. To answer your questions, we thought we’d go into a bit more detail about what those maps are and how they help us reconstruct such a large and complicated environment as Riven. We have a similar ‘area map’ for each island. We have made extensive use of a detailed top-down map of Riven’s five islands (you can find it in the Prima Strategy Guide) to break each island into what we call ‘areas’. This helps us organise ourselves, allowing us to group objects and tasks by area and making it much easier to visualise what needs to be done next. 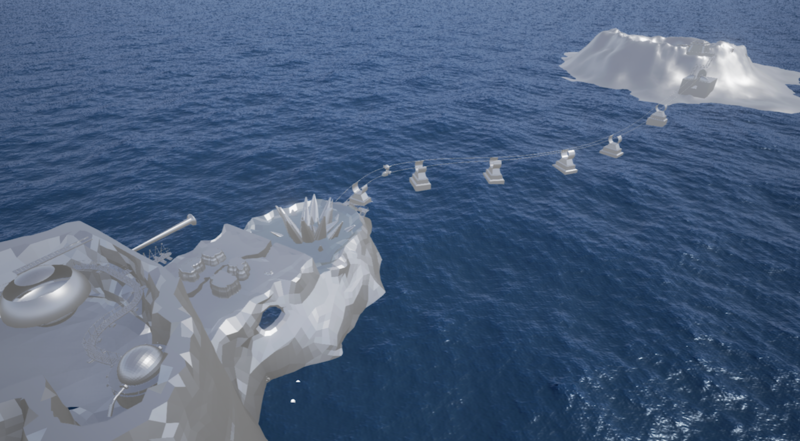 Breaking up an island into sections also means multiple people are able work on it at the same time without getting in each other’s way. An earlier version of Boiler Island’s area map. Unfortunately, the map isn’t always trustworthy. We suspect that most (if not all) of the interiors are just inventions based on a best guess, and there are other parts of the map (especially on Jungle Island) where the map clearly deviates from the actual game environment. 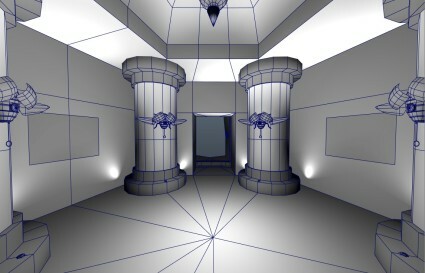 This can be very problematic, as in the past we’ve tended to over rely on it for placing objects in a scene. This is especially prominent in areas that are mostly indoors, like Survey Island’s interior. The ‘camera-matched’ environment compared to the area map below. As you can see, not only is there a significant scale disparity between our camera-matched geometry and the overhead map, but the map even gets the shape of the pentagonal elevator shaft backwards! To solve these difficulties, we have a simple rule. Whenever there is a conflict between the original game and the overhead map, we will always defer to the environment as represented in the original stills. They remain the best possible reference. That, however, is a topic for another day. Last month, our art team worked hard on two primary tasks: creating assets for the greybox scenes we presented last year at Mysterium, and camera-matching new ones. 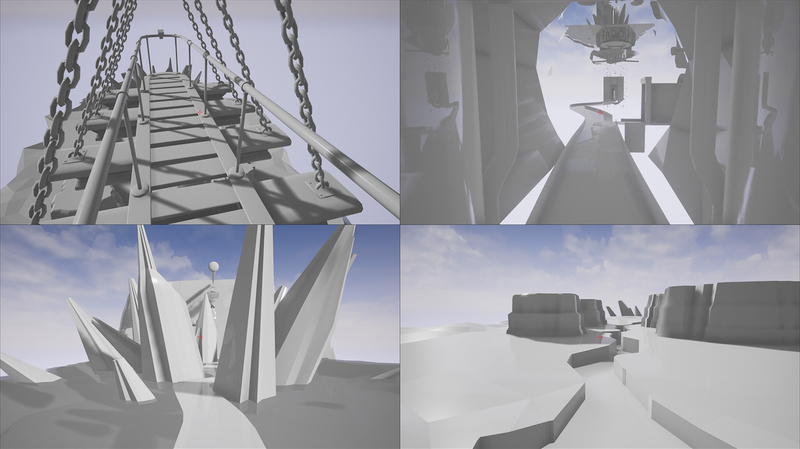 Here’s a sneak peek at some examples that have been shared by various members of the team. Remember, all of this work is still ‘in progress’ — and we welcome any comments or questions you may have! 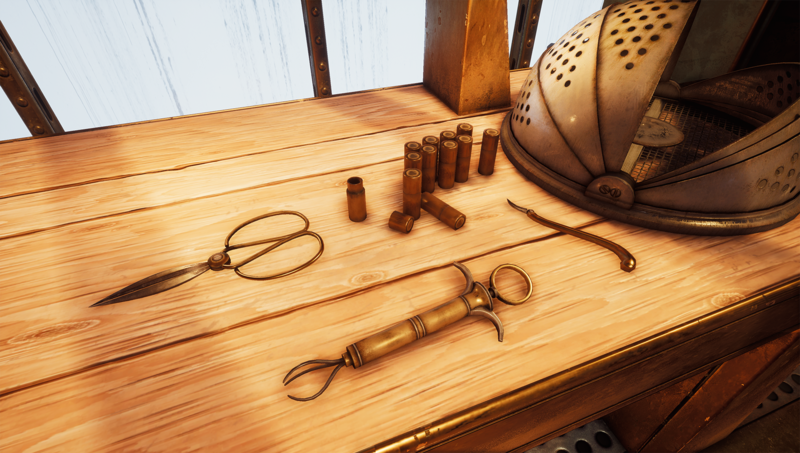 Some objects you may recognise from Gehn’s lab on Boiler Island. 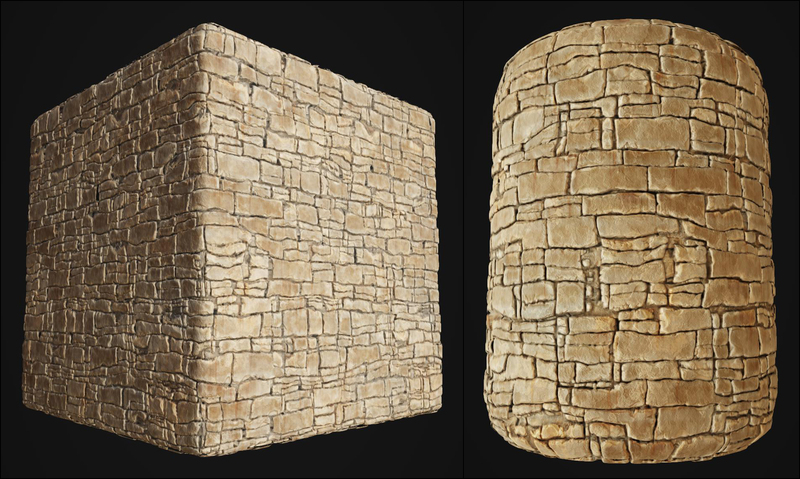 These were created by the latest addition to our art team, Francois Hurtubise! Camera-matching the exterior of the dome. The red and green wireframes shows the work our artists are doing on top of the original Riven images. Camera-matching the interior of the dome. Note the yellow wireframes. As you can see, there’s lots of important work being done! And it highlights the benefits of the new pipeline we instituted last year — we have different areas in various stages of development, so we can move forward with camera-matching new areas while our artists start filling in more detailed assets in previously-matched ones. Looking forward to sharing more soon! Happy new year, Riven fans! What a year we had! 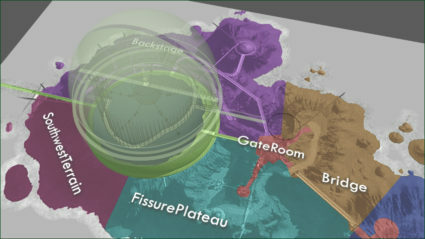 We welcomed seven new immensely talented people to the team, we were able to ‘greybox’ several large areas of the game which we proudly presented at Mysterium in Salt Lake City, and we even started exploring areas of development that we’ve not attempted previously — like motion capture solutions for our character animation. We’re all aware that this update has been a long time coming, and we apologize for the radio silence since August — we’ve all just been so busy! To make it up to you, here is our new year’s resolution: We will be providing at least one update per month for the duration of 2017. We’ll keep you informed — and we trust you’ll hold us to it! And a special thanks to all those fans who reached out to us during this time to ask about the project; your support means a lot to us. 2017 is going to be a fantastic year for the Starry Expanse project. We can’t wait to continue sharing this journey with you. UPDATE: Watch the recording of the presentation here! Today’s the big day! Follow Mysterium along with us at https://www.twitch.tv/mysteriumcon — presentation will start at 3:30 Mountain Daylight Time. Upon us in the month of August are potentially many events that may make or break the future of humanity. The most critical of these events, of course, is the 19th annual occurrence of Mysterium (the Myst fan convention). This will be our seventh year presenting at Mysterium, and our show this time is going to be quite the departure from previous years — so be sure to tune in! See you there! And if you’re bored in the meantime, take a look at some content from our previous Mysterium shows. Wow, it’s been a while, hasn’t it! Sorry about that. Rest assured, the last few months have been extremely active for us, and we have a lot of cool stuff to show for it! 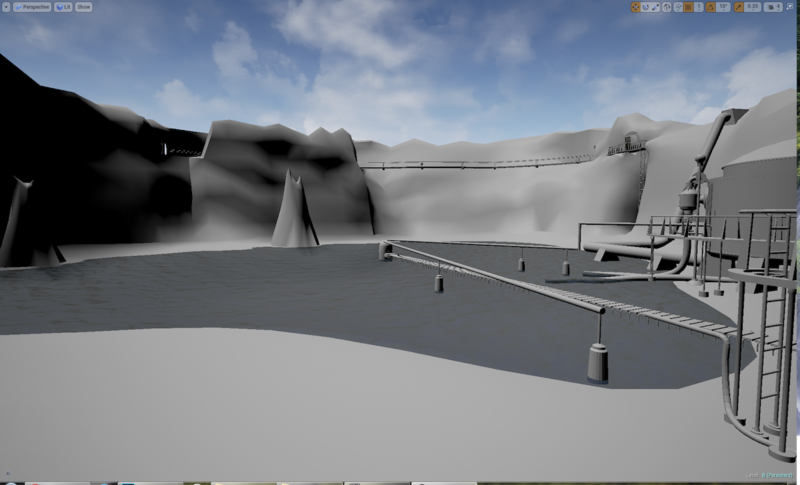 Our camera matching has come along really really well, and we’re in the process of loading our matched assets into Unreal now. 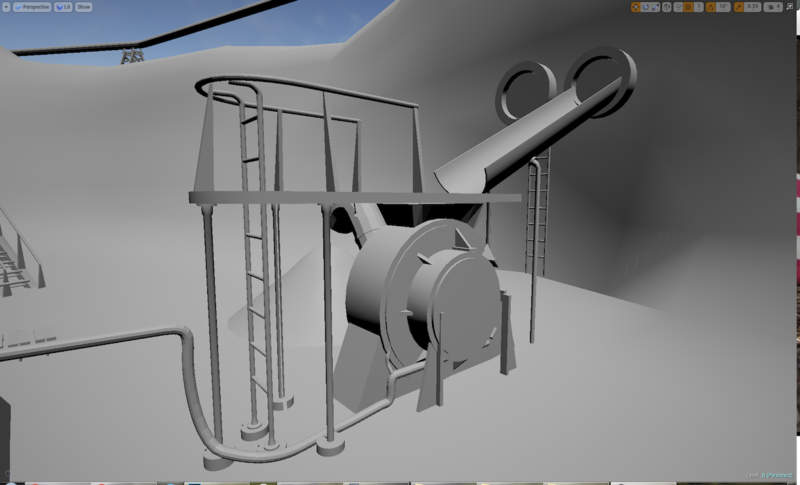 Keep in mind that these are stand-in models, the first step in creating art assets for our game. 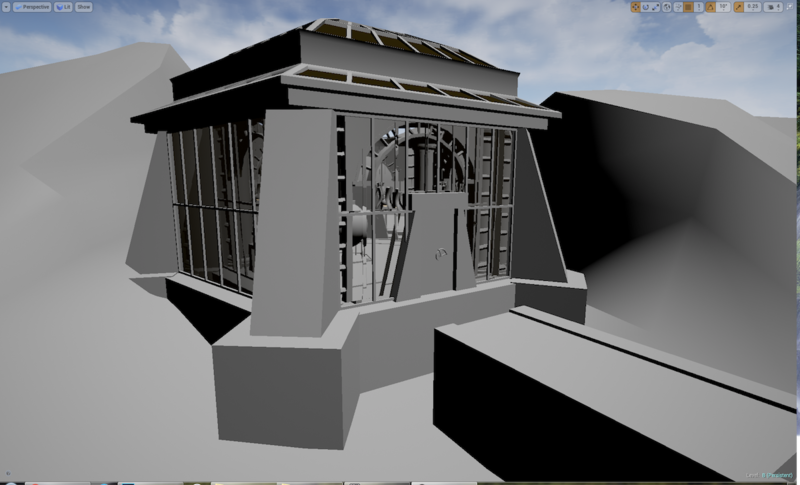 They’re definitely a work in progress, but having them done gives us a template to follow when sculpting high-poly models, and allows us to start work on interaction programming. Pretty soon we’ll have a fully playable game! Then we just have to make it look pretty. That’s all for now, we’ll see you in August!